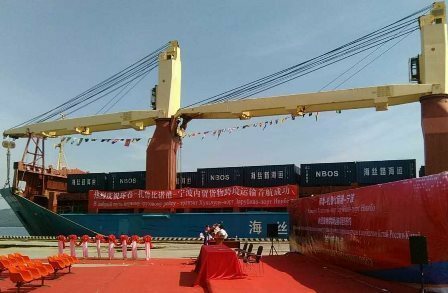 New transit line, Hunchun (China) – Zarubino (Russia’s Primorsky Territory) - Ningbo (China), has been launched as part of the international transport corridor Primorye-2. According to the press center of OOO Troitsa Bay Seaport (MPBT), operator of the only international seaport in Zarubino, Chinese ship MSR №1 loaded with 200 containers with corn left for the port of Ningbo. Ceremonial launching of the line has been held today, 14 September 2018, at Zarubino port. The ceremony was attended by Bayin Chaolu, Secretary of the Jilin Province Committee of China’s Communist Party; Yan Wenbin, Consul General of China in Vladivostok; Dzhambulat Tekiyev, Chairman of the Regional Policy Committee of Primorsk Territory’s Legislative Assembly; Igor Melnikov, Head of the Far East Railway’s International Network Service. During the ceremony, OOO Troitsa Bay Seaport signed a cooperation agreement with ZAO North-East Asia (consignor) and Ningbo-Zhoushan port (consignee) to develop the new route, promote investment, economic and trade logistics for building up cargo turnover between China and Russia. The parties undertake to streamline customs procedures, remove administrative barriers for transit cargo clearance and enhance cooperation in port infrastructure development. According to the statement, Troitsa Bay Seaport is going to carry out modernization and reconstruction of the port, work on improvement and expansion of services in the field of transit cargo transshipment and clearance. “Troitsa Bay Seaport is the key element of the international transport corridor Primorye-2. It high-speed an advantageous geographical location and extensive experience in different projects and port operation”, emphasized Andrey Perevalov, General Director of OOO Troitsa Bay Seaport. Primorye-2 is one of two transport corridors between China and the Far East of Russia providing the shortest route for cargo transportation between China and the countries of the Asia-Pacific Region. Troitsa Bay Seaport (MPBT LLC) established in 1981 is a state-of-the-art port with annual capacity of 1.2 mln t. Troitsa Bay Seaport operating round the year is the only port in Zarubino (south of Primorsky Territory) close to the border of Japan, China, South Korea and other APR countries. MPBT is the only operator of port facilities in the Troitsa Bay. It is a multi-purpose complex for transshipment of wide range of cargoes, offers services on customs and transport paperwork. Key types of cargoes handled at the port – frozen fish, containers, aluminum, sawn timber and other general cargo.